Panoramic tour of Delhi, the capital of the Indian Union, which has many faces. First, Old Delhi, the ancient city of the Mughal sultans with steep and narrow streets teeming with people and New Delhi, the capital of the Indian Empire with wide tree-lined avenues designed as a garden city. Visit Jama Masjid largest mosque in the country, surrounded by narrow alleys and bazaars, the popular area of Chandni Chowk, Red Fort, the center of the Mughal splendor, Raj Ghat, Qutub Minar and the minaret. The boulevards of New Delhi and the inevitable Connaught Place Humayun's Tomb. Overnight at hotel. Morning drive to Agra. About ten kilometers before the finish, stop at Sikandra which is the magnificent mausoleum of Emperor Akbar, one of the greatest leaders of the Mughal empire. This red sandstone and white marble edifice stands in a huge garden and differs from other Mughal monuments in its architecture: a tasty mix Hindu, Muslim and Buddhist. Then, drive to Agra. Visit the Red Fort, imposing building, located on the banks of river Yamuna. Simple fort in the 11th century, Emperor Akbar decided five centuries later, to Agra his capital and rebuilt in order to make a residential palace in addition to a strategic military point. All this harmonious buildings and extreme refinement in the decoration of private apartments. Overnight at hotel. 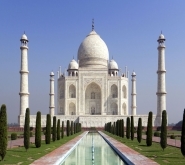 At sunrise visit Taj Mahal, unforgettable white marble mausoleum. It is inside the Taj Mahal, in an underground crypt, rests Mumtaz, wife of Emperor Shah Jahan. Grief crazy, he built her this tomb whose work lasted 22 years. Entirely of white marble, its decoration made of semi-precious stones overlay it a true masterpiece. The route continues to the ephemeral capital of Fatehpur Sikri, built by Emperor Akbar to commemorate the birth of his son. It was only inhabited for 15 years and then deserted by lack of water. Then drive through the beautiful countryside to get to Jaipur. Abhaneri stop and visit a beautiful wells degrees, the Chand Baori. It is the oldest and deepest wells degrees in India. Overnight at hotel. Morning drive to Amber and splendid fort atop a rocky outcrop. Amber was the capital of Rajasthan before being dethroned by Jaipur in 1728. It joined the ancient fortress on elephant back or jeep. Visit multiple palaces contained the fort. The magnificence of this set demonstrates the power qu'atteignirent the Rajput princes at that time. Back to Jaipur and visit the City Palace, the royal palace combines Mughal and Rajasthani architecture and sumptuous museum containing many treasures. Continuation with the visit of the Astronomical Observatory, Jantar Mantar Observatory, built in the 1700s, still held today regarded as futuristic. End of the visit, stop at the legendary Palace of Winds, Hawa Mahal, multiple lattices. 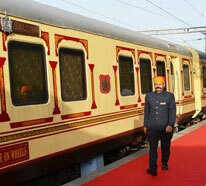 It was built for women of royal families so they can attend processions safe from prying eyes. Overnight at hotel. The morning ride by cyclo in the old town full of colorful markets and bazaars. Typical areas have not lost this special atmosphere there for centuries. Departure to Mandawa and visit this village in Shekkhawati, real air art gallery open from Rajasthan. 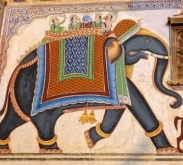 Visit the havelis, sumptuous residences of caravan traders, illustrated with colorful and naive frescoes. Typical village of the region, it is not unusual to see black pigs and camels at the corner of an alley. Overnight at hotel. Discovery of some nearby villages: Fatehpur, a small town near Mandawa founded in the 15th century and former capital of a small Muslim state that retains some of the most beautiful havelis in the region. Nawalgarh has many havelis and it is a pleasure to walk through its streets. Then, drive to the international airport in Delhi and return flight to France. For a pleasant stay near the Taj Mahal. Spacious, comfortable and well equipped. Hearty breakfast. Former residence of the Maharajas of Jaipur, this beautiful place is a must visit. Charm, luxury, refinement and facilities to these places full of history. A sumptuous and elegant setting if you want to get married in India. Former palace of Maharaja of Mandawa converted into heritage hotel in the heart of an authentic village. Nice big well equipped and decorated in the traditional style. A note of yesteryear for this hotel features beautiful gardens and a pool.